U.S. retail sales in April recorded their biggest increase in a year as Americans stepped up purchases of automobiles and a range of other goods, suggesting the economy was regaining momentum after growth almost stalled in the first quarter…….”The retail sales report shows that recent claims of the demise of the U.S. consumer have been greatly exaggerated,” said Steve Murphy, a U.S. economist at Capital Economics in Toronto. Yes, April has one fewer day than March so there is a matter of seasonal adjustment. But that’s where the shenanigans start. For crying out loud, seasonally-maladjusted, weather-whacked single month deltas from the rickety government statistical mills are only one step removed from noise. But they are seized upon by the financial press because the latter are exceedingly lazy and always on the prowl for anything that might be “good news” for the stock averages. But that’s what Bubble Finance has come to. Namely, a cult of the daily stock market that is so myopic, superficial and sycophantic that it has practically reduced financial journalism to noise, as well. To be sure, there is plenty of information in the Census Bureau on-line data base that shows in an instant that the vaunted American consumer is running out of steam. As will be documented further below, there is not a snowball’s chance that the debt besotted consumer can save the US economy from the demise that lies ahead. Even these sharply weakening trends overstate the case. The above figures include auto sales, which have rebounded under the tailwind of soaring auto lease and loan finance. In fact, practically any consumer who can fog a rearview mirror has gotten a car loan, but that is not a good thing; it’s a booby-trap as explained below which will boomerang in the years ahead. Meanwhile, yeaterday’s Census Bureau release provided unmistakable evidence of an exhausted consumer that the media cheerleaders missed altogether. By contrast, during the last 24 months, non-auto sales have barely crawled higher, rising from $343.3 billion in April 2014 to $355.0 billion in April 2016. That’s less than a 1.7% annual rate. Moreover, even if you credit the BLS’ comically understated CPI, it is evident that inflation adjusted sales outside of autos are now rising at barely a 1.0% annual rate. It would take less than five minutes to spot that dramatic slowdown by scrolling through the Census Bureau data. Apparently, the algos which scanned the April release and posted the stories didn’t have the milliseconds to spare. 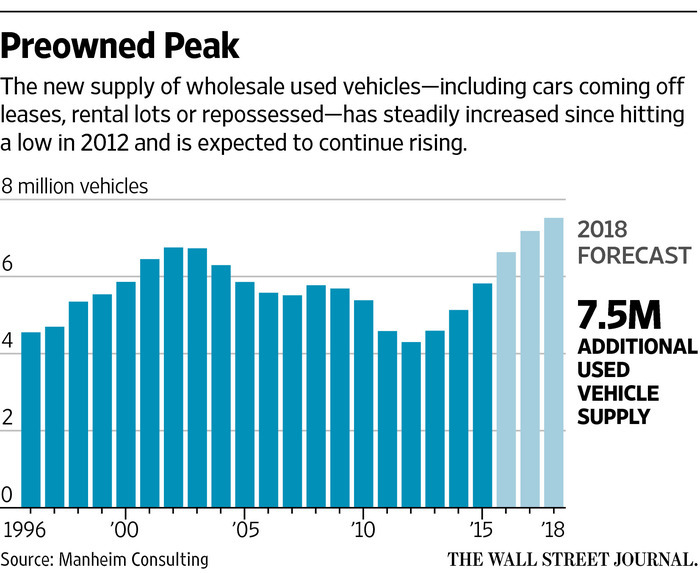 Likewise, it wouldn’t take long to see that even auto sales have shifted to a distinctly lower gear. 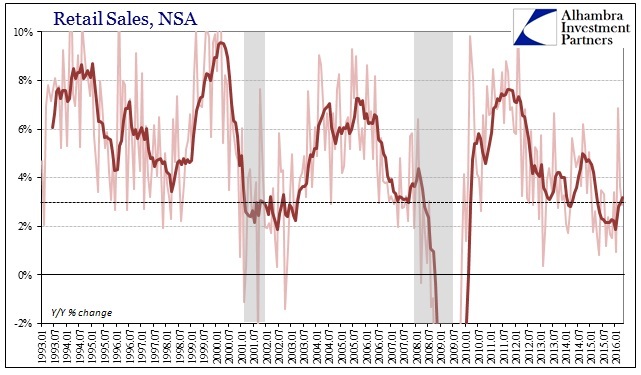 April NSA auto sales were up just 3% on a y/y basis compared to annual gains of 10% to 15% early during the recovery, and from the exceedingly deep cyclical hole that accompanied the GM/Chrysler bankruptcies in 2008-2009. That’s right. Exactly 99.72% of the gain in sales was funded by more debt. And during the last year it has gone off the deep end; auto loans have grown by $54 billion while annualized sales have climbed by only $28 billion. Here’s the thing, however. The worm is fixing to turn because the used car market is facing an unprecedented tsunami of used vehicles coming off loans, leases, rental fleets and repossessions. As shown above, used vehicle prices have been weakening for the last several years, but between 2016 and 2018 upwards of 21 million vehicles will hit the used car market compared to just 15 million during the last three years. More than 25% of PCE is accounted for by government income transfers led by social security and medicare—both if which are heading for insolvency in the years just ahead. On top of that, the surge in household leverage ratios in the two decades leading up to the 2008 crash and arrival of Peak Debt added a further layer of spending power derived from credit expansion, not production and wages. As a result, as Beversdorf’s chart demonstrates, the share of PCE accounted for by transfer payments and consumer borrowings has soared from 24% in 1993 to nearly 36% today. This means that the prospective trend of consumption spending is as much a matter of fiscal policy and household credit health as it is wage and salary growth. Yet had the 1993 transfer payment/consumer debt share remained constant at 24% of PCE——today it would be only $10.2 trillion, if you assume that the growth of government transfer payments on the margin was financed with Federal borrowing. So contrary to Reuters and its Keynesian quote standbys, it is not true that “the demise of the U.S. consumer have been greatly exaggerated”.